Also this Sunday, is the athletic department's annual (?) garage sale. Items up for sale are listed in the release below. We're hearing some 07 Nike game uniforms and 08 Adidas game uniforms will be up for grabs. I call dibs on the Sam McGuffie jersey! ANN ARBOR, Mich. -- The University of Michigan football program will hold its annual Fan Day on Sunday, Aug. 14, at Michigan Stadium. The autograph session and opportunity to meet the 2011 Wolverines team will run approximately from 2-3:30 p.m. EDT. Prior to Michigan football’s Fan Day, the U-M Athletic Department will hold a garage sale from 8-11 a.m. at the indoor track building, which is located just beyond the right field fence of U-M’s baseball field. Items for sale include football jerseys, football pants, footballs, shoes, polo shirts, t-shirts, shorts, basketball practice jerseys, warm-up jackets, warm-up pants, robes, gloves and other merchandise. Fan Day at Michigan Stadium is free and open to the public. All gates at the Big House will open starting at 1 p.m. Parking will be available in the lots adjacent to Michigan Stadium and Pioneer High School. 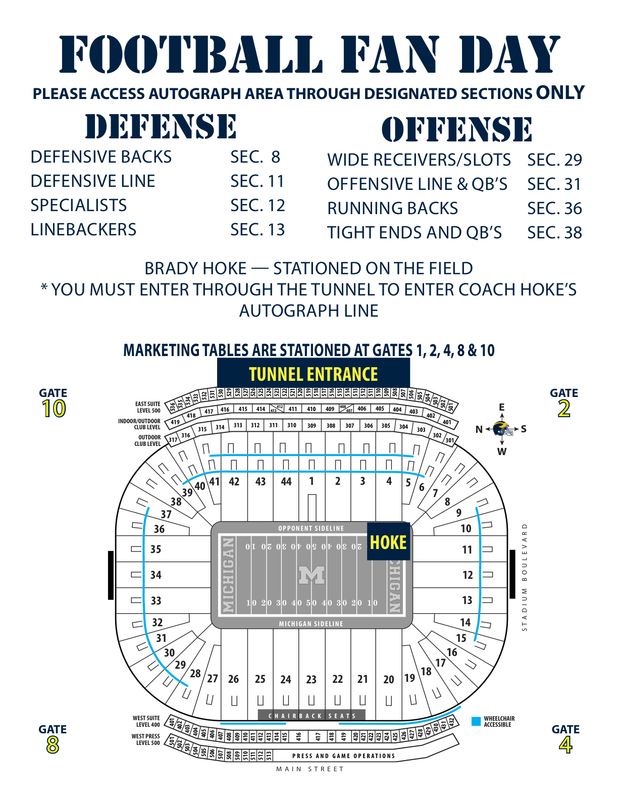 In order to expedite the autograph process and accommodate as many fans as possible, players and Head Coach Brady Hoke will autograph one item per person. 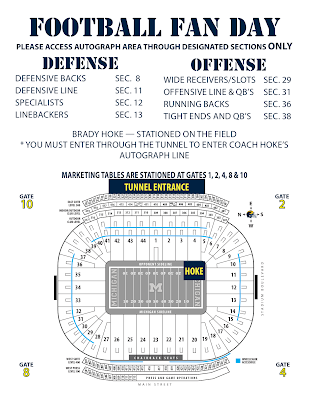 Hoke will sign autographs on the Michigan Stadium field, and his line will be accessible only through the main tunnel on the east side of the stadium. Michigan players will be signing autographs along the north and south concourses at the concession stands by position groups. The offensive players will be located along the north side of the Big House between sections 29 and 38, with the defensive players residing on the south side between sections 8 and 13.